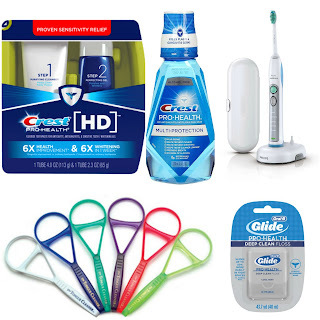 I'm going to take a turn from fashion ONE MORE TIME and talk about my favorite dental products that I love and use daily. I feel like it's pretty appropriate since that's my job and everything. I think I went on a little toooo long, like always, but there's so much I wanted you to know! Toothbrushes: First thing's first.. toothbrush and toothpaste. I'm hooked on my Sonicare FlexCare because 1.) it was free, and 2.) it's an electric toothbrush! I'm telling you, I can always tell a positive difference in patients after they have switched from a regular plastic manual toothbrush to an electric one. You don't have to spend a ton of money either! No matter if you spend $10 or $100 on an electric brush, they're going to brush better than a basic toothbrush. I found a great electric brush at Walmart for $5.97. It's an Oral B Pro Health, it just takes one AA battery, and you can even buy replacement heads for it. Many electric brushes like mine are $$ and technologically fancy, which isn't even necessary! At my office we always recommend Oral B because they have a round brush head which fits around your teeth better and gives a better brushing. Toothpaste: Crest HD. I could go on and on about how awesome this toothpaste is, but I'll try not to. It's on the pricey side for toothpaste but it's worth every penny (around $13). It was originally created as an antimicrobial toothpaste for periodontal disease patients, but it's so amazing across the board that it's recommended for anyone. Now that it's been out for a while, it's also proven to relieve temperature sensitivities. I have used this toothpaste since it came out probably around 2 years ago. It's TWO steps, the directions are simple and on the box. The only active ingredient in the first step is stannous fluoride, which allows it to act and clean better, but it can sometimes cause a surface stain. That's why there's step two, it's just a hydrogen peroxide gel. And we all know that's what WHITENS teeth! I've gotten multiple people hooked on this stuff and they'll all tell you the same thing-your teeth feel amazingly smooth and clean after you're done brushing, like you've just left the dentist. I've never once had staining from this toothpaste, and I also drink coffee on the daily. You won't get results as good as Whitestrips, but it will keep you more sparkly for sure! Plus, you're supposed to brush for 2 minutes, so this is a good way to get that done. I have had a few patients tell me they weren't crazy about it, but that's rare. Floss: Oral B Glide Deep Clean floss is the bomb. It's SO smooth and SO minty. So no more excuses of "my teeth are too tight to get through". The only thing ALMOST as good as using actual floss is using floss picks like Plackers. Those are great to keep with you in the car, in your purse, heck, throw them around like candy. I'm telling you, yes I know we stab you with metal picks, but regular flossers do not bleed at all during cleanings. I swear, scouts honor. Also, after I spend 45 minutes cleaning someone's teeth, there are still specks of plaque and food debris that I remove by flossing at the end. It's honestly the only way to clean right between your teeth. Mouthwash: I keep Crest Pro Health mouthwash and ACT mouthwash in my cabinet. I like the Crest because it's alcohol free so, no burning! And my teeth feel smooth way longer into the day vs when I don't swish with this after brushing. I also really like ACT because all of their mouthwashes have added fluoride. Fluoride really helps keep your teeth strong and fight against cavities. They don't taste the best though, so I'll probably pick up a kids bubblegum flavor next time, hehe. Tongue scrapers!! Does anyone remember the Lizzie McGuire episode where she goes to the dentist, gets home and calls Miranda and Gordo to tell them about this nasty thing she got that scrapes her tongue clean? Hahaha, well after that episode is when I started using a tongue scraper. They're in the toothbrush aisle and are cheap. I can't brush my tongue, I'll heave my breakfast up every time. But I can scrape the heck out of it. It feels amazing to get the morning breath (plaque) off my tongue first thing every day. You need to try one, I use this DenTek one. 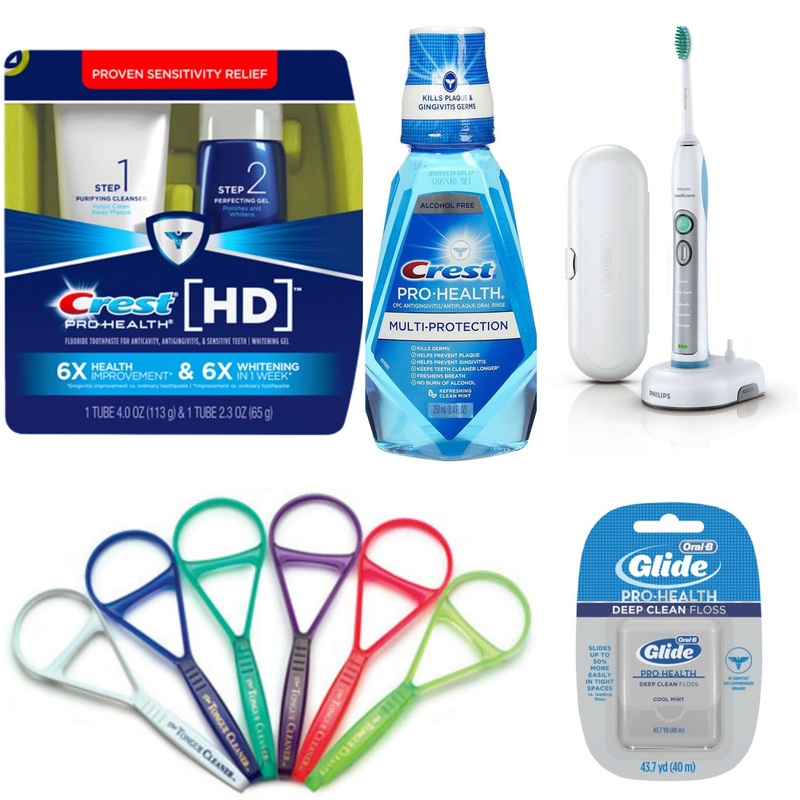 Whitening/Bleaching: I rarely bleach my teeth, I just stick to my Crest HD toothpaste. (I have bondings on my front teeth that won't bleach). But these Crest Professional Effects Whitestrips have great reviews and I've heard good feedback with them. The key to all white strips is to follow directions and finish them out. Many people don't see results quickly enough and give up. If sensitivity is a problem when bleaching then try using a sensitive toothpaste while you bleach or ACT fluoridated mouth wash. Or both. Yes sensitivity is uncomfortable but it's just temporary. It's because the nerve (pulp) inside your tooth gets mad and irritated from the bleach. My OPINION on AP24 Toothpaste: If I've been asked once, I've been asked ten times.. this stuff in a nutshell is just a fad and a money racket. First of all, there isn't any ingredient in this that actually whitens your teeth!! It works because it has very abrasive silicates (plastics) in it that polish plaque and stain off of your teeth, which is what we do at the dentist when you get a cleaning. So, you take someone with coffee and tea stained teeth, let them use this, they're going to think it's wonderful. Take someone who always has pretty white and clean teeth with good home care.. they're not going to see a difference. Do I think using one tube of this will cause damage to your enamel? Probably not. Do I think using this daily for months on end will cause damage? Yes. If you are constantly using heavy abrasives on your enamel, it's going to rough up your enamel's surface which will eventually attract and soak up stain. No matter what the commercials say, you can NOT rebuild enamel, you can only try to keep the enamel that you have left strong. Plus, any product that gives you major results in 3-5 uses is very fishy to me. Like I said, this is my opinion only. Have I used this toothpaste? No. Do I want to or will I ever? No way. Crest Whitestrips or an office-made bleach tray are fail proof and safe ways to actually whiten your teeth. But if you sell this stuff, you go Glen Coco! Make some money!